Based on two decades of experience in manufacturing of high-quality machine tool frames, especially in milling machines and machining centers, Smartech has been widely recognized as one of most reliable and innovative companies in this field. Soon after Mr. Zheng resigned from China National Machinery & Equipment Import & Export Corporation, Smartech was established and our first turret milling machine was assembled in Shenzhen city. Located in the first Special Economic Zone, we are fortunate enough to get involved in the fatest growing of this country, as well as the world come to its eyes. Along with the development of China economy, the requirement on quality and quantity of CNC machine has been growing dramatically during the last three decades. As a result of responding to the requirements of market, nowadays our products covers a surficiently wide range of almost all sizes of different kinds of frames, started from milling machines, to vertical machining centers, turning machines, horizontal machining centers, brigde-type machining centers, drilling & tapping centers, engraving machines, horizontal boring and milling machines, swiss lathes, etc. 1. The concept of 'Detailed Division Of Labor' is implemented throughly in the structure of our organization, process of production, and the integrity of FRAME itself. 3) Horizontal machining centers from DMG (Germany). 6. Good support from most of the major component suppliers of world-leading levels: Germany Rexroth, Germany R+W, Germany INA, German FAG, Germany ZF, Spanish Korta, Spanish Ipiranga, Japan NSK, Japan THK, Taiwan Hiwin, Taiwan PMI, Taiwan Royal, Taiwan Posa, Taiwan Spinture, Taiwan Spinder, Taiwan Detron, Taiwan Parkson, Taiwan GSA, Taiwan Deta, Taiwan Poju (S&Y), Taiwan Chen Sound, Taiwan Keyarrow, American Pioneer, American Timken, Sino-American Byjur (JV), Sino-Japanese Nika Yoki (Herg), etc. 6. With a large quantity of castings ready for production, we can respond quickly to your requirements. For popular models we have frame ready to deliver. "The success of customers is our success." The value we have been trying to deliver is, 'The success of customers is our success', to support our partners catching their local markets, we always devote ourself into upgrading our manufacturing capacity, offering a wider range of products with perfect performance, outstanding reliability and excellent precision, last but not least, at competitive prices to our distributors. 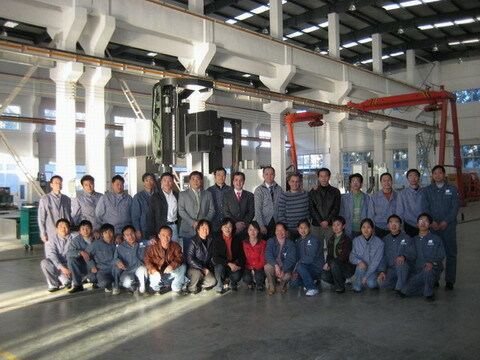 Thanks to the efforts of our dealers home and abroad, we are now doing ODM and OEM for clients from United States, Italy, Spain, Australia, Mexico, South Africa, Iran, Brazil, Poland, Turkey, Vietnam, Portugal, etc. *Horizontal Machining Centers - Horizontal 3-axis, Horizontal 4-axis, Pallet Changing 4-axis and Dual-column HMC. *Bridge-type Machining Centers - Engraving Machine, Bridge-type Machining Center, Grantry Moving Series, Beam Moving Series.